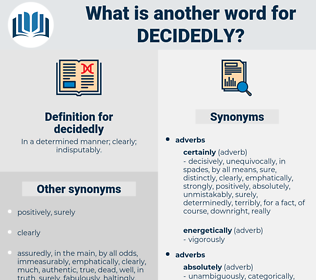 What is another word for decidedly? In a determined manner; clearly; indisputably. no ifs ands buts about it. 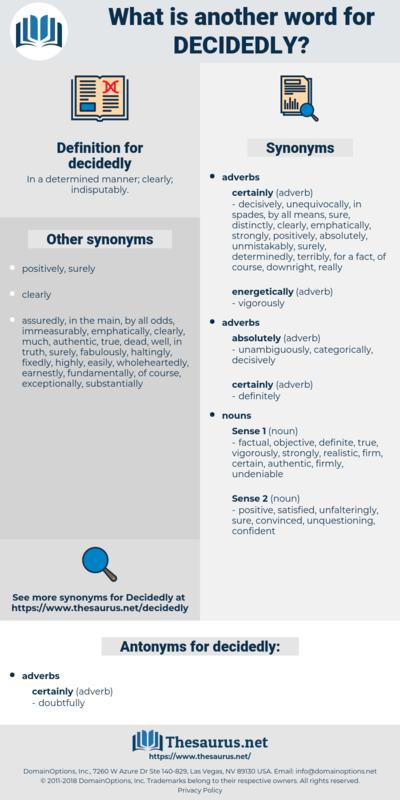 decisively, resolutely, determinedly, certainly, absolutely, clearly, emphatically, firmly, categorically, undoubtedly, undeniably, Definitively, strongly, markedly, considerably, utterly, unquestionably, manifestly, unequivocally, totally, quite, steadfastly, patently, staunchly, obviously, significantly, very, surely, unmistakably, vehemently, vigorously, radically, demonstrably, energetically, forcefully, noticeably, evidently, extremely, indisputably, wholeheartedly, really, crucially, highly, completely, incontrovertibly, substantially, purposefully, plainly, flatly, downright, doubtless, eminently, roundly, particularly, admittedly, fiercely, deeply, fairly, robustly, entirely, fundamentally, frankly, conspicuously, indeed, incredibly, appreciably, positively, conclusively, explicitly, exceptionally, squarely, unambiguously, incontestably, grossly, aggressively, much, adamantly, seemingly, honestly, boldly, fully, dramatically, extraordinarily, distinctively, drastically, specifically, blatantly, remarkably, profoundly, sharply, visibly, wholly, critically, overwhelmingly, greatly, Overtly, genuinely, steadily. I must first ascertain whether Alexander decidedly wishes for war.
" I shouldn't wait," I said decidedly. deucedly, diastole, dishtowel, digital, dactyl, distil, ductile, distal, dazedly, discoidal, dejectedly, ductule, distill, dish towel, doggedly.